A cousin of the beech marten weasel that shut down the Large Hadron Collider recently, pine martens are just as prone to chewing up plastic and rubber interiors of cars to make nice warm nests, for example. This has led to offers of marten-proofing for garages, marten damage insurance offers and electronic marten repellents. As a result, some départements of France include them on their list of ‘nuisance species’ meaning they can be legally destroyed. Some communes reportedly even offer ‘tail rewards’ (primes à la queue) of around €3 for each tail produced. The association has already made an official complaint about an association of marten trappers, and is prepared to do so against any other similar groups. Martens, says ASPAS, are an important part of the eco-system. Close relatives of wolverines, mink, badgers, ferrets and weasels, they mainly eat squirrels, mice, rabbits, birds, fish, insects, and eggs, supplemented with fruit and nuts when available. As adults, they are solitary (about the size of a small cat), only meeting to breed in late spring/early summer. Martens give birth to litters of up to five kits, which are born bald and blind. These are weaned at around two months and leave the nest at about four months old. Martens will eat carrion, which helps keep the land clean – and another important function is keeping the grey squirrel population under control. They hunt introduced grey squirrels while leaving native reds largely alone. In turn, they are hunted by golden eagles and red foxes but their major threat comes from humans. 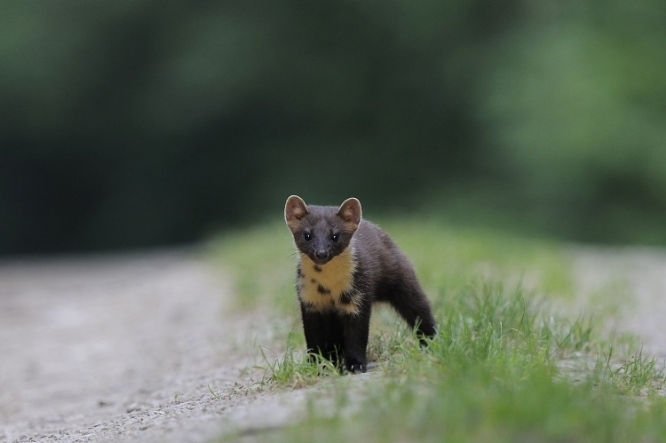 Deforestation and pollution takes their toll and for many years pine martens were trapped for their fur but the main threat is from hunters, says ASPAS. If you know of any hunters’ organisations that are targeting pine martens, or comes across any offers of primes à la queue, you should report it to ASPAS directly (details below).